"Hands to Work, Hearts to God" was the credo that this religious group lived by. They were some of the hardest working folks there ever was and their inventions are something that all gardeners still use today. They also treated women as equals long before it became commonplace. Today this group would probably be called a cult. They were doomed to extinction the day they were established. You see men and women were strictly segregated. They worked side by side during the day, but when the day was over they went their separate ways. I first discovered the Shakers back in the 1970s when my wife and I visited the Shaker community at Pleasant Hill, Kentucky which is a short drive west of Lexington. This is bluegrass as well a horse country; the drive along the two-lane country road is some of the most beautiful scenery that I have ever seen. We were there in early April celebrating our wedding anniversary; the daffodils were up in the pastures, wisteria in full bloom hanging from the oak trees. The Shaker compound at Pleasant Hill is surrounded by a stone fence that has been there for many years. It has been restored and is maintained by a foundation that makes the community available to the public. Before we get into the contributions the Shakers have made let me tell you about how this group began. Shakerism was born in Manchester, England in 1747 when members of two religious groups, Quakers from England and Camisards from France, were brought together by their shared beliefs that the Second Coming of Christ was approaching and that the only way to prepare for that event was to seek a life of perfection by following the inner light of the Spirit. The newly formed group called itself the Believers. In 1774 they migrated to North America to escape religious persecution for their beliefs. They settled the village of Watervilet, New York. Their beliefs led them to live communally, away from the rest of society. Missionaries were sent out to preach the Shaker doctrine. Since the Shakers did not have children of their own, they had to recruit members from the outside world. In the early years, the Shaker community provided a great deal more security and comfort than did life outside. Many outsiders found the demands of the Shaker faith a small price to pay for a safe life and the communities flourished. As more converts came into the order new communities were established across the country in locations such as Kentucky and Ohio. They believed that their work as well as their lifestyle was their way in showing their devotion to God. Marriage was not allowed among society members-the Shaker "family" did not arise from the union of two individuals, but from a common commitment among members to the service of God. The Shaker creed involved a commitment to the equality of the sexes, men and women shared equally in the leadership of each community as well as in the tasks required to provide for the family. This religious creed was the foundation for the development of Shaker industries. At least two Shaker communities claimed to have been the first to produce seeds for sale. Joseph Turner of Watervliet, N.Y., recorded that he set aside the first acreage for seed raising in 1790. 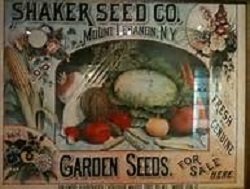 Gardeners at New Lebanon, New York began selling their surplus seed in 1789 or 1790, but did not set aside land for this purpose until 1795. By that year, the societies of Hancock, Canterbury, and Enfield, New Hampshire had joined the enterprise as well. The New Lebanon community appears to have been one of the most successful overall: one of the longest-lived seed businesses and one of the most innovative. They came to refer to themselves in their advertisements as "The Shaker Seed Company." Early offerings of seeds were limited, but, as sales increased, many varieties were added to the seed lists. New Lebanon records indicate that the best-selling seed in the late 1700s to early 1800s was onion. Seedsman Artemas Markham listed 201 pounds of onion seed produced and sold in 1795. 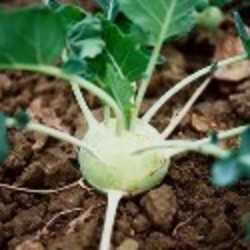 Other vegetable varieties sold in that first year included scarcity beet (a fodder beet, also known as mangel-wurzel), carrot, cucumber, and summer squash. 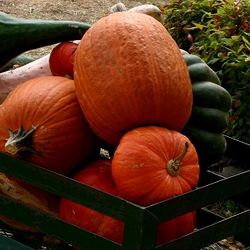 In that year, a combined total of 44 pounds of these varieties was sold, with an income listed at $406. The next year, records indicate that two varieties of turnip and three of cabbage were added to this list. By 1800, income from sales of seeds other than onion at New Lebanon had more than doubled to $1000. A number of societies joined the early producers in the first years of the 19th century. By 1820, nearly all the Shaker societies were producing seed for sale. Records show that at least 16 of the 18 long-lived societies had seed production enterprises. From the 1780s until the mid-1800s, the Shakers were the only source of purchased seed available to rural Americans. Commercial dealers offered seed for sale in and around major cities on the east coast, but poor transportation and mail service limited the availability of these sources to rural communities. At first, nearly all commercial vegetable seed was imported from Europe, with later sources being market gardeners and contract growers. Only a few of the larger companies raised their own seed beginning in the mid-1800s. Most seed dealers operated this business as a sideline and many went into the business knowing little or nothing about seed or plants. One such early seed dealer was Grant Thorburn, who began selling vegetable seeds in his grocery store in Philadelphia in 1809. Evidence suggests that some commercial seed dealers obtained seeds from the Shakers. In the early days, the Shakers sometimes supplemented their stocks with seed from "the World" By 1819, however, a covenant among the societies was signed that allowed only inter-village purchase, so that quality could be maintained. The quality of their seed was an issue that transcended marketing or profit making. The Shakers are thought to have developed the innovation of packaging seeds for sale in small paper packets. This invention is attributed to James and Josiah Holmes, of Cumberland County, Maine. Before this time, seeds were generally sold in bulk in cloth sacks. Early seed packets were plain brown paper with only the variety name, the society of origin, and sometimes the gardener's name or initials printed on the front The first packets were cut and glued by hand in eight sizes. The seed packet sizes were referred to in New Lebanon Shaker journals by their use: Pound-bag size, bean size, beet size, onion size, cucumber size, cucumber long size, radish size, and lettuce size. By 1810, cutting and printing machines were developed to speed this process. Packets were boxed in wooden display boxes and were marketed widely after 1810. The options for marketing this and other products were limited at that time. 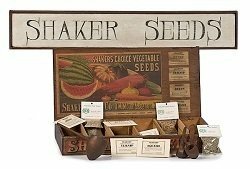 Some sales were made by mail-order, but most of the Shaker goods, including seeds, were sold by Shaker peddlers, who established routes throughout the northeastern United States. Wagons were packed with boxes of seeds, as well as herbs and herbal medicines, preserves, dried apples, brooms, cloth, wooden chairs, and many other items. Goods were sold door-to-door, village-to village, or provided to shopkeepers on consignment. It was by bringing their goods to rural communities that the Shakers were able to dominate the seed market in the United States for the first half of the 19th century. This marketing strategy worked well for the Shakers, and was continued by some societies into the late 1800s. The Shaker Seed Box became a fixture in many general stores across the eastern United States. A typical seed box held about 200 packets, selling for 5¢ to 6¢ each. So when you tear open that seed packet take a moment to consider how this method of packaging came about. 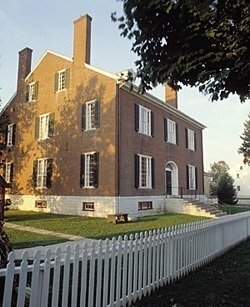 If you get the chance to visit central Kentucky take some time to visit the Shaker Community at Pleasant Hill. The buildings have been restored, the first floors to the uses that they were used for in the past. Many of the second floors have been converted to hotel rooms for overnight guests. The dining room serves authentic Shaker food that is some of the best I've ever eaten. I will share a Shaker recipe from a cookbook I purchased while there. Crumble stale bread. Soak for 20 minutes and milk and salt. Combine eggs, sugar, vanilla, and not make; beat very well. Pour mixture over the bread, stir lightly. Steam tightly covered with foil in pan set in hot water for about 45 minutes at 350°. Cover with meringue and bake at 300° for 15 minutes. Serve with brown sugar sauce. Mix sugar and flour well. Add boiling water. Cook mixture until thick. 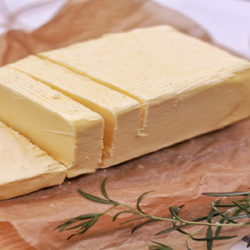 Remove from heat and add butter and vanilla.